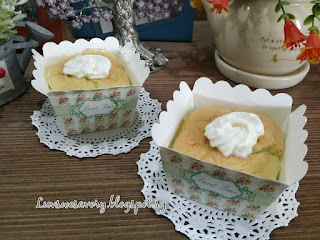 Really love the pandan fragrance ... and the sweet looking pastel green in petite cupcake liners. 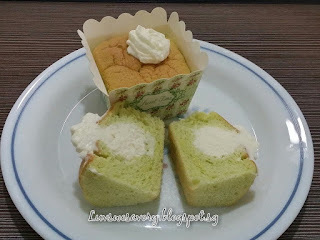 My big kids love anything sweet ... glad that I could satisfy them with these petite pandan hokkaido chiffon cupcakes that were not too sweet, lesser amount of fat (no butter & sugary buttercream) as compared to some typical sugary frosting cupcakes. Below my slightly modified version. 1) Preheat oven to 160°C. Position the rack in the center of oven. Note: The temperature of the oven may vary, do adjust accordingly. Arrange cupcake liners on baking tray. 3) In a clean mixing bowl, whisk the cold egg whites till foamy using the electric mixer. Add in the lemon juice and gradually add in caster sugar in 3 separate additions and beat till stiff peak, formed into a firm meringue. Transfer to a big bowl and chill in the fridge. 4) In the same mixing bowl, cream together egg yolks and caster sugar until pale and thick using the electric mixer (about 3 - 4 minutes). Add canola oil and continue beating. Once the oil has been incorporated, add coconut milk and pandan extract and mix well. 5) Next, add the sifted cake flour and mix until just combined. 6) Gently fold 1/3 of the meringue into batter with a spatula. Fold the remaining meringue into the mixture in 2 batches until it looks evenly mixed (no streaks of meringue). 7) Scoop batter into pre-arranged cupcake liners to about ¾ full. Gently tap the baking sheet a few times on table top to release the trapped bubbles in the batter. 8) Bake at 160°C for about 18 - 20 minutes. Check for doneness with a toothpick inserted into the center if it comes out clean. Remove from the oven and allow to cool completely on wire rack. 9) Once the cupcakes are cooled, fill whipped cream in a piping bag fitted with a round nozzle (I used a open star tip nozzle). Push the piping tip into the center of the cupcake and pipe/squeeze some amount. Decorate the top to your desire. Chill for a couple of hours before serving. Freeze the cleaned mixing bowl for about 10 minutes. Take it out from the freezer, immediately put together the cold whip cream and caster sugar in the cold mixing bowl. Use the electronic mixer to whisk till stiff peak form. Add in the dessicated coconut and mix to combined. Chiffon is my favourite foam cake. 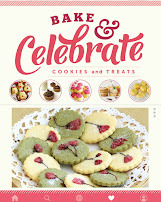 I love this with that natural light green colour from pandan and airy soft crumb. Excellent! 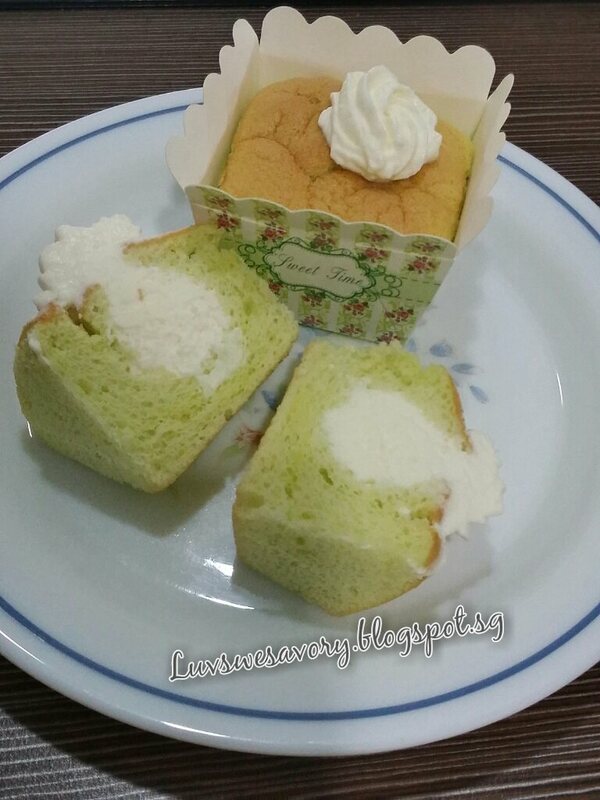 Hi Karen, love your Hokkaido chiffon cake, look really nice. Thanks for sharing your recipe. Hi Karen, thanks for leaving comments in my blog. Oh no!sorry to hear that your "oven caught fire". Perhaps it's time to change a new oven? Lovely pandan chiffon cupcake, so cute in their little boxes. I love the smell of natural pandan and the light green colour is just nice for me. Karen, I love your lovely Hokkaido Chiffon Cupcakes especially because they are pandan flavored! Your cakes looks delightful! 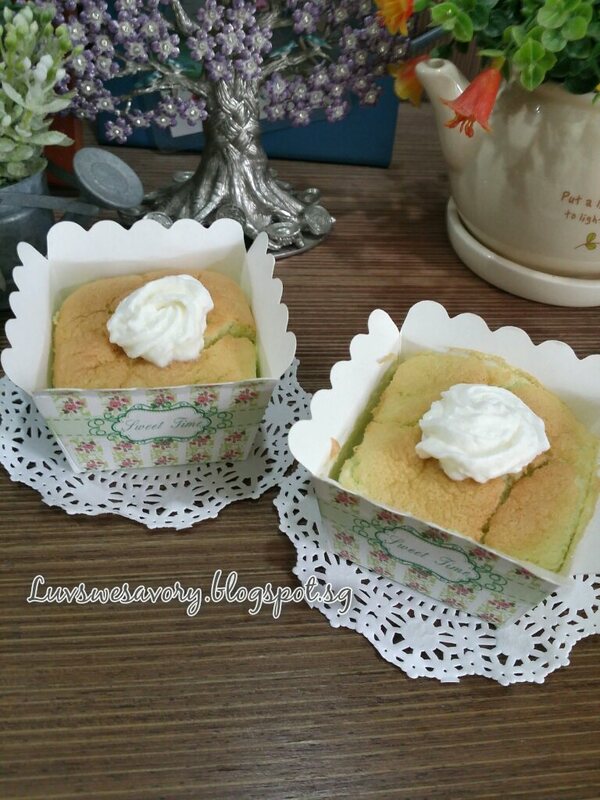 I have not baked Hokkaido chiffon cupcakes in ages, and thought of baking it again when I was clearing my stack of cupcake cases the other day! These cupcakes look delicious Karen, have never tried pandan before,would love to try. Lovely. I'm just imagining me having a cup of tea with this. 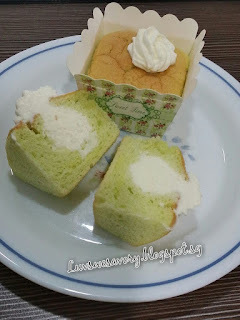 I love chiffon cakes - always satisfying! Sharing some of my favourite recipes, some new baking/cooking "adventures". Please feel free to post your comments for my improvement. Would be great to connect with you and learn some of your recipes too. Thanks for 'dropping by'. Hi, my name is Karen, a working mum with 2 lovely young adults and love spending weekends to cook, bake and explore some healthy meals & snacks for family. 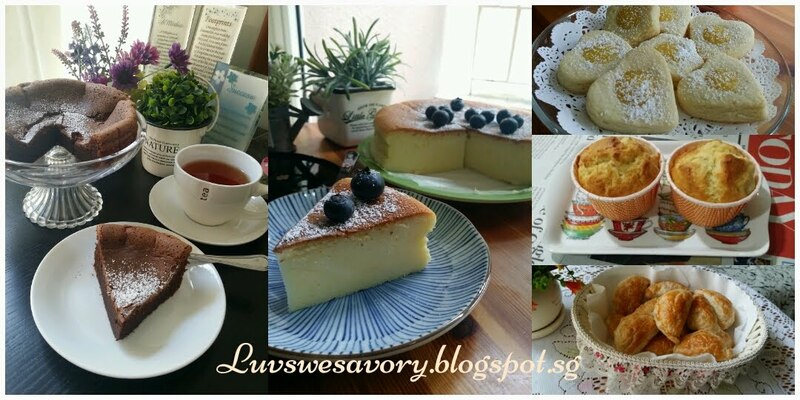 All Rights Reserved © Copyright 2014-2018 Luvswesavory.blogspot.sg. Watermark theme. Powered by Blogger.